But now let’s get started with Madame de la Motte-Guyon. Prayer is the key of perfection and of sovereign happiness; it is the efficacious means of getting rid of all vices and of acquiring all virtues; for the way to become perfect is to live in the presence of God. He tells us this Himself: “Walk before me, and be thou perfect” (Gen. xvii. 1). Prayer alone can bring you into His presence, and keep you there continually. What we need, then, is an attitude of prayer, in which we can constantly abide, and out of which exterior occupations cannot draw us; a prayer which can be offered alike by princes, kings, prelates, magistrates, soldiers, children, artisans, labourers, women, and the sick. This prayer is not mental, but of the heart. It is not a prayer of thought alone, because the mind of man is so limited, that while it is occupied with one thing it cannot be thinking of another. But it is the PRAYER OF THE HEART, which cannot be interrupted by the occupations of the mind. Nothing can interrupt the prayer of the heart but unruly affections; and when once we have tasted of the love of God, it is impossible to find our delight in anything but Himself. Nothing is easier than to have God and to live upon Him. He is more truly in us than we are in ourselves. He is more anxious to give Himself to us than we are to possess Him. All that we want is to know the way to seek Him, which is so easy and so natural, that breathing itself is not more so. There are two means by which we may be led into the higher forms of prayer. One is Meditation, the other is Meditative Reading. By meditative reading I mean the taking of some truths, either doctrinal or practical—the latter rather than the former—and reading them in this way:—Take the truth which has presented itself to you, and read two or three lines, seeking to enter into the full meaning of the words, and go on no further so long as you find satisfaction in them; leave the place only when it becomes insipid. After that, take another passage, and do the same, not reading more than half a page at once. It is not so much from the amount read that we derive profit, as from the manner of reading. Those people who get through so much do not profit from it; the bees can only draw the juice from the flowers by resting on them, not by flying round them. Much reading is more for scholastic than for spiritual science; but in order to derive profit from spiritual books, we should read them in this way; and I am sure that this manner of reading accustoms us gradually to prayer, and gives us a deeper desire for it. The other way is Meditation, in which we should engage at a chosen time, and not in the hour given to reading. I think the way to enter into it is this:—After having brought ourselves into the presence of God by a definite act of faith, we should read something substantial, not so much to reason upon it, as to fix the attention, observing that the principal exercise should be the presence of God, and that the subject should rather fix the attention than exercise reason. If you like, read more here http://www.gutenberg.org/files/24989/24989-h/24989-h.htm#png.022. yes indeed her and a bunch of other ladies–including yourself. Many women in the past had only one possibilty to flee from an unwanted spouse and countless pregnancies which were often related to an early death in childbed by retreating into a covenant or monastery. I remember that I too could not accept everything that Mme Guyon wrote. Since her writings were eventually published through the RCC, we might as well presume that some things had been modified so that they matched better with all that Catholic stuff. That is one of the reasons why I enjoy being independent from any churchly influences as to my writing, being only dependant on Him who leads me and who enables me to write what is really on my heart and mind without the slightest censorship. Also, I was reminded of another French mystic woman with whose book “The Mirror of Simple Souls” I struggled in the past as well. 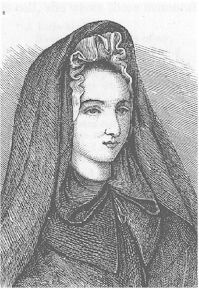 I am speaking of Marguerite Porète who was burnt at stake by the Inquisition in 1310 because of her “heretic” writings. She was an highly intellectual woman whom I thought to be a bit “ungrounded”, or in order to put it bluntly, I thought she was nuts. 🙂 Yet even if so, that would have been no reason to condemn her as the church did, would it. Nonetheless, many years later and due to my own experiences with walking in the spirit, I know that she was right. Completely right!! However, she lived at a time where she had to be careful about WHAT to say, or rather write, because women were not acknowledged as being able to be taught by God Himself. And thus she wrote somehow fictional about the deeper things God had shown her. Her intention was to free people from being enslaved by sin, by false religion, and by themselves. If the average believer of the RCC had really been able to grasp what she taught, he would have seen that the RCC was not necessary to be attended. Quite the contrary, he would have become free from mere human teachings and man-made religion through the loving kindness of God Himself. Tsk tsk tsk…Michael…truly, I do NOT know why I wrote this response to you the way I did. Hopefully, God knows (big grin). Susanne, thank you so much for your reply. I am sorry you had to do it twice, but you know what is funny? I just lost a long reply that I was writing to your comment as well! 🙂 This happens to me when I have to look up something on the net to put in the reply… oh well. We have to believe that the Spirit is in this as well, especially when I get off into an intellectual reply instead of writing from the heart of our Father, and writing about the history and the evils of religion can get me off on a tangent every time. Losing peace and joy is a certain sign for not walking in the spirit (cf. Gal 5:16, 22-23 ESV). Whenever I feel “forced” to say or write something because I am nervous, upset, or even angry, I must remind myself that these are simply reactions of the flesh (Gal 5:20 ESV) and therefore I ought to ignore them by simultaneously seeking His comforting and peaceful presence again. And they did not receive him, because his face was as though he would go to Jerusalem. And when his disciples James and John saw this, they said, Lord, will you that we command fire to come down from heaven, and consume them, even as Elijah did? But he turned, and rebuked them, and said, You know not what manner of spirit you are of. For the Son of man is not come to destroy men’s lives, but to save them. And they went to another village. You are a wise man, Michael. Would it be not normal when we love somebody to take sometime for that special one? The same with God. If we do love Him, it would be normal to take at least every day some time to be with Him and to talk (with Him (=pray). I agree wholeheartedly with you!! Thanks so much for taking the time to comment, my friend. Thank you for the insights on praying without ceasing. Yes and amen. And yes, when we have become one with the ONE, our hearts do not necessarily need a language that can be heard by anyone, as you so aptly pointed out by referring to your heart relationship with your wife. This was a great comment, Wayne! Yes, learning that the kingdom of heaven is in the midst of us, in our inward parts has made all the difference with me as well. Glad to see that another construction stiff is on the same page, my brother! ONE!!! This mystery is where He has had me for many months. One with Christ just as we are to be one with our wives. Intimacy! With God it is always about intimacy not religion. Love you, my brother! Susanne-Michael to take that a step further with wife and comparing it to our relationship with the Lord, we have been together for 45 yrs dating for 3 married for 42. i can see the reality of being one, especially as we get older. most of the time when one talks the other says ” i was just thinking the same thing” to the point we can finish each others sentences. i want that communion with the Lord where my thoughts are His thoughts and our oneness truly manifest outwardly ( life ) Michael the Lord has definitely been shining more light and clarity on the kingdom within ( Christ in you ) as He the day Star is rising in our hearts. (2 Peter 1:18-19 18 And we heard this voice which came from heaven when we were with Him on the holy mountain.19 And so we have the prophetic word confirmed, which you do well to heed as a light that shines in a dark place, until the day dawns and the Day Star rises in your hearts ) it seams the Holy Spirit is speaking along those lines of an internal work to alot of the people i talk with. Thank you so much for your supporting and edifying words on Michael’s and my gift of writing. Thanks a lot for the encouragement, my brother. Every blessing to you and your dear wife!! What a wonderful relationship you have with your dear wife. So few couples reach this kind of unity for it takes time and lots of patience and love… but it is worth it. This is truly a mystery as Paul records in Ephesians chapter five about husbands and wives who are truly ONE and the sacrificial love that we husbands are to have for our mates. Then he ends up by saying that he is also speaking of Christ and HIS body (the church). He speaks in bodily terms here. This relationship that Jesus wants with each of us is VERY personal, to the point that He cares for each of us in the most personal way, washing us all over with tender care like a man would do for his invalid wife. Except Jesus washes us clean and spotless with His personal word, His revelation that cleans us from the inside out. What a Husband we have in Christ!!! One other thought, my brother. Could it be that He uses us to show the same care for our fellow members of His body as we listen to His voice and share what He is saying to His Bride? Oh, the love of God that He has placed in our hearts for one another! I love you, my brother! It is good to hear that you love meditation with Scripture, Jacqui. I think it is the Lord Himself who draws us to these things we could do in order to get to know Him better. In the past I too had such thoughts of being in a monastery for some time as a kind of compensation to my busy life. I even thought about a lonesome “vacation” in the desert. 🙂 But one day I realized that it is not necessary to flee from the place I live in order meet God, I only need a place to “hide” from hustle and bustle. Primarily, I have the bedroom where I go whenever I want to pray, that is, when I want to be alone with the Lord. Lying on my bed, I close my eyes and look for Him inside of me until He shows up. Often times I need to initially get rid of unnerving thoughts and cares by asking Him to free me from that stuff. But sooner or later, my dialogue with God and Jesus passes into a more and more silent and peaceful stage. YES!! I love silence, too. Sooo much!!! Actually, I stopped reading books and watching TV exactly 6 years ago and I do not miss it. There was one sister who once asked me with whom I would love to spend my time most of all. As I told her that there is nothing better in this world than meeting God alone – in silence – she shook her head in surprise. 😉 Not that it is always a HIGH when I am alone with God. Sometimes there is still something to be healed in my heart and I spend my prayer time with weeping. But afterwards I always feel better and deeper connected to Him than before. Moreover I, like you, love prayer walks that much, though without a dog (mine died many moons ago). I even go biking to one of “my” prayer benches in the country of which I know that I won’t meet a lot of people there. Indeed, there is no place where God could not be found.